Kit's Inventive - Nonstick Palette Gray Unbreakable Synthetic Rubber [ 8 Well ] The New Unique Paint Palette Type Very Easy-Clean Miniature Small Craft Painting by Kit's Inventive at Designers Artists. MPN: LYSB00Q1BV4ZC-TOYS. Hurry! Limited time offer. Offer valid only while supplies last. '' Middle Gray '' allows you to more clearly visible of Light & Bright Tones or to compare Shades of Color. This is the new type of paint palette.
" Middle Gray " allows you to more clearly visible of Light & Bright Tones or to compare Shades of Color. This is the new type of paint palette. 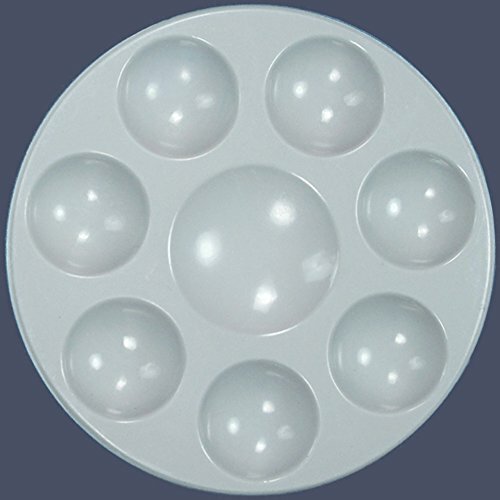 The palette is made from synthetic rubber. Unique by Superior Properties. Paint can easily " Peel Off ". Clean with just water and Soap or Dishwashing liquid. No need any special methods. For use with Water-Based* Acrylic Paints, Face Paint, Fabric Paint, Painting Mediums And Varnishes. For Art painting, Miniature or Model Painting, Fabric paint, etc. [ Please use with good quality paints to avoid staining on palette ]. Do not soak Thinner or Acetone in the palette longer than 2 hours. Protected by intellectual property rights. Don't Copy this Product ! Authentic products only made and imported by " Kit's inventive "
** Good quality! Please try it yourself. Thank you very much. Artist color palette designed specifically for acrylic paints, face paint fabric paint and washable kid's paint. Fastest & easiest to keep clean by peel off or just water and soap. Weight is good and not easy to slip. Very convenient to carry. Flexible. Not sharp & non-toxic ( safe for everybody ). Eco-friendly product. Very durable & long-term Use ( 5+Years ). Art supplies for drawing, painting for kids, school or arts crafts hobby tools. If you have any questions about this product by Kit's Inventive, contact us by completing and submitting the form below. If you are looking for a specif part number, please include it with your message.